Blackberry lily is a perennial herbaceous plant belonging to the genus ‘iris domestica’. It is a plant of bulbous origin of ‘iridaceae family’ but not a true lily plant. It is also considered as an ornamental plant due to its beautiful appearance. It has several other common names such as Rhizoma Belamcandae, leopard flower, Freckle Face, Shegan, Balamcanda Rhizome and so on. It is named after its berry (blackberry lily).It has short life span. It is native to/originally found in Central Asia, India, China, Japan, Russia etc. This plant can be easily grown and cared. This plant was most famously used in China and is often called ‘the Chinese Herb’. From long time back, it was produced in various places of China such as Hubei, Henan, Jiangsu and Anhui. It was the only member of plant belonging to the genus Belamcanda. Based on the moleculer DNA sequence evidence, Belamcanda chinensis got transferred to the genus ‘iris’ (iris domestica) in 2015. The old name has a general use in the present days. It is said that it was the first Chinese herb collected by Shennong Bencao Jing. Description: Blackberry lily also called Belamcanda chinensis is a perennial plant with bulb or is tubular. This flower is unique and very eye-catching. It is of Chinese origin. This attractive herbaceous plant has many herbal uses and is planted in the garden for the purpose of garden landscaping or even planted in the pots as it is considered as the gardens ornament due to its beautiful appearance. Its flower resembles lily while the leaf resembles iris and its seed resembles blackberry. When the seed pods open during the autumn season, a cluster of black seeds resembling blackberry pops out of the pods. This is how this plant got its name as blackberry. Its bloom last only for a day but is replaced by new blooms during its active growth during the summer months. It is of 1 to 2 feet height and spreads up to 2 to 4 feet. It has fast growth rate and grows upward with medium texture. The stem of this plant stands erect. It is a healthy plant; it is not attacked by pest. It consists of two species. They are B. chinensis and B. flabellata, orange coloured and yellow coloured respectively. They are commonly found in the hillside, fields, grasslands and open areas. It is possible to replant this plant through the process of seed plantation or through the division of the rhizome. It is usually a self-sown plant but it may get withered very easily. Flower: Blackberry lily has uniquely, beautiful flower, attractive to the eyes and are greatly loved by the flower lovers. The lily-like flower comes in 3 to 5cm in diameter, 2 whorls and oval tepals. It is star-shaped with six petals. It is typically orange in color spotted with red to black freckles and has 3 stamens with an outgoing anther. Its color differs from red, orange, red-orange, bright yellow or even mixed in color. The beauty of blackberry lily flower does not last long i.e. just for a day. No worries, during the bloom season the worn out flowers get replaced by the new rising flowers. The flower has pale orange background or yellow. The petals are beautified by the dotted spots giving them the common name leopard lily. Bloom: Bloom of this plant takes place from summer to autumn (July to September). The bloom has a unique character of closing at night in a twisting form. The bloom of this plant is followed by a cluster of black fruits in the autumn season (August to October), resembling blackberry fruit. This is the reason for it being named blackberry lily. 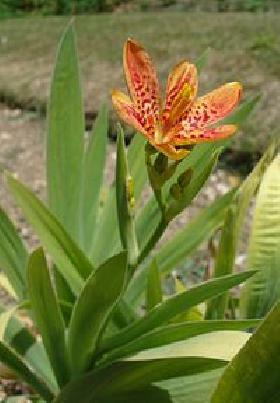 Leaf: Blackberry lily has a linear shaped leaf with alternate arrangement, simple in type and has entire margin. The leaf is with parallel venation, leaf blade is 12 to18 inches long, green in colour with no color change during the fall. The leaf is flat, pointed and sword-like. It grows in a fan shape. Rhizome: Blackberry lily has fibrous roots. Its rhizome is in bright yellow colour. It contains irigenin, tectoridin, belamcanidin, iridin, irisflorentin etc. The dried rhizome has been used for medicinal purpose in the Eastern Asia to inhibits different kinds of ailments from a long time. It inhibits/prevents strong pathogenic fungi, viruses such as adenovirus, throat disorder. It has anti-inflammatory, antipyretic and analgesic effects. Propagation: It is possible to propagate this plant through seed or by division of the rhizome during the spring or late summer. Growth and Care: Growing and taking care of the blackberry lily is not much a problem. It grows easily on the roadsides and fields. It is possible to grow even in container. The bright yellow-orange spotted flower gives an extra glow to our garden or home. It blooms throughout the summer months (each dead bloom is replaced by the newly arriving bloom). It actively blooms in summer with full sunlight but can also tolerate light shade. It is an evergreen plant where the environment has mild climates or deciduous climate to some extent. In places where the climate is cold during the winter, it is advised to cover the plant with protective mulch. Well, in case of extreme climate; you are suggested to take the rhizome and place it in a frost free environment. Blackberry lily is a care-free plant in nature. A little care should do more than enough. It is well advised to water the plant during its active growth, in the mean time allow the soil to dry out in between the watering intervals so as to avoid rotting of the bulbs. Remove dead or dying leaves so as to keep the plant fresh. Although the plant can thrive in any loose, sandy loamy and well-drained soil, it is good to amend the soil with compost manure or loosen the soil. Caution: some part of this plant can turn out to be poisonous. So, it is suggested to be extra careful while planting this plant near children or even pets. 1) It is suggested to plant the bulb an inch or half deep in well-drained soil during the spring or early fall at a sunny location to partly light location. 2) Transplant the plant when two true leaves have appeared with 15 to 18 inches of spacing. 3) Flowers will start blooming in its second year of the plantation but it may also start blooming in the first year itself in case of early plantation. 4) Water during its active growth but not too much of it for it does not require much moisture (it requires only a moderate amount of water). 5) Make sure that the plant is kept in area where it can receive full sun to medium amount of sunlight. Uses of Blackberry lily: It is surprising to see that the blackberry lily is not only used as an ornamental plant but is has numerous medicinal uses too. Its medicinal uses were first discovered by the Chinese people, thus, it is known as the Chinese herb. The dried part of rhizome is has the main medicinal uses. This plant is used raw in case of medical treatments. Sophora subprostrata or Shan Dou Gen is preferred in case of severe throat problems for it has strong healing power. Belamcanda rhizome is use for the treatment of phlegm reduction. · From the long time dried part of the rhizome was used for the treatment of throat pain, asthma, gonorrhea, malaria, phneumonia, swollen liver and spleen in the East Asia. · This herb has the capacity of removing toxicity, clearing heat. Thus, the rhizome of this plant serves to relieve sore throat and cough. · This herb supports the proper functioning of lungs by reducing inflammation and flight viral infection. · It helps cure bronchitis, mastitis and acute hepatitis too. · It has anti-cancer properties for the treatment of throat cancer, lung cancer, prostate cancer etc. What might be the side effects of blackberry lily? Although blackberry lily has lots of good uses, it does have some side effects to consider when used in excess. This plant has lead to diarrhea and some other forms of poisoning too. This is due to the excess or wrong use of the plant. Long term use of the plant can cause weakness in body. This herb must not be used during the period of pregnancy and loose stool caused by spleen deficiency. a. Approximate time for germination is 24 days. b. Transplant the plant after about 39 days of plantation. c. The plant gets matured after 318 day.